In the slums of Lajpat Nagar in South Delhi, around 70% of girls drop out after grade 8 and those who continue have little or no interest in Science, Technology, Engineering and Mathematics (STEM) subjects. Girls from these communities attend government schools where the quality of education is often poor. Even though they have subjects such as physics, chemistry and computer science, they never get to use a computer or science lab in their school. Girls’ fear and lack of understanding of science, technology and mathematics leads to poor academic performance and often results in them dropping out of school. A study conducted by FAT in 2014 in 8 local Government schools around Lajpat Nagar revealed that girls have much bigger barriers towards achievement in STEM subjects because of the gendered challenges that they face, such as workload at home, lack of support from family and teachers to pursue education, pressure to get married before the legal age 18 years, lack of financial support, gender-based sexual and domestic violence and reduced mobility. These girls belong to low income migrant families and are affected by lack of at-home support resulting from low parental literacy and pressures to supplement family income rather than study. The average income of their families is $150-$200 a month which supports a family of 5 to 7 people. Women are mostly domestic workers and often their daughters join them at work at an early age which result in missing school. Parents often prioritize investing in their sons’ education. A recent UN report shows that girls and women constitute only 14% of the total scientific community in India. Negative perceptions and stereotypes of STEM as a ‘boys only’ path or for the geeky and unattractive girls, also inhibit girls’ likelihood of developing an interest in these fields. In addition, girls do not receive adequate training, infrastructural support in schools, role models to aspire to in technical fields and on-the-job experiences, to pursue STEM fields. FAT was founded in 2008 by Gayatri Buragohain to work towards the empowerment of girls by increasing their access, interest and participation in technology. Their programs focus on breaking societal stereotypes and attitudes, encouraging and enabling women to feel comfortable in working with technology. They mainly work with adolescent girls from socially and economically disadvantaged families who come from urban settlements. FAT’s programs include STEM training, basic computer training, skill-building courses and practical assignments. At their Tech Centre, they provide women with real-world technical training and vocational guidance. Their multi-pronged strategy, reaching grassroots girls, corporate executives and other women’s groups, FAT seeks to address the needs of women at various stages of technological capacity and create a web of influence and support for technological savvy adolescent girls. The founder and Director Gayatr is a strong leader and an engineer by training. She is Ambassador for the Association of Computer Machinery for Women (ACM-W) India and a member of ACM India Council. She is also a renowned advocate for young women in STEM fields and the recipient of the Anita Borg Institute’s Change Agent Award for her work in STEM sector for underprivileged girls and women in India. EMpower’s 3rd grant to FAT will provide one year of curriculum-based training in Science, Technology, Engineering and Mathematics (STEM) subjects to 30 adolescent girls through an Innovation Lab in Lajpat Nagar, Delhi. 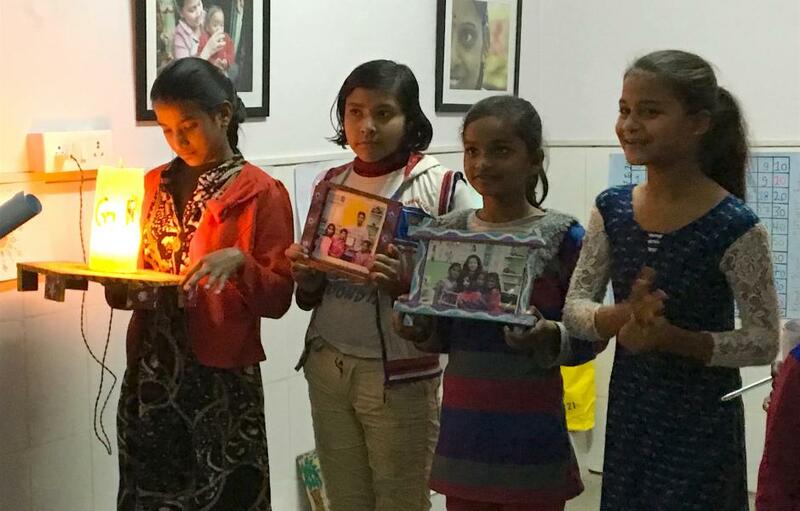 FAT works with marginalized girls in the slums of Lajpat Nagar and builds their technical capacities to enter STEM pathways for further schooling and jobs. Where is Feminist Approach to Technology Society? 2017 With and For Girls Award Winners announced! You can support our work with Feminist Approach to Technology Society and our other grantee partners.